Swindon Town manager Paolo di Canio says he has no case to answer regarding racism claims made against him by loan striker Jonathan Tehoue. Di Canio is under investigation by the Football Association after he was alleged to have referred to Tehoue, 28, by his skin colour, not his name. But the Italian, 43, told BBC Wiltshire: "It's a non-story." The BBC had learned that Swindon wrote to the then-Leyton Orient forward's lawyers and apologised for the remarks. However, publicly Town have voiced their support to Di Canio. Swindon's solicitor wrote in response to the French player's lawyers in April, saying: "The club wishes to make it clear that it does not condone the reference made by Mr Di Canio during training on 29 March to your client. "The club accepts that the use of this phrase was inappropriate and apologises to your client for any upset that this has caused him." Swindon released a statement on 15 May saying that, following an internal investigation, they would give their full support to Di Canio. And the Wiltshire club reacted to the BBC's findings on Tuesday saying the lawyer's letter was sent "before an internal inquiry had been completed by the club in response to the complaint made by the player" and that "accordingly we continue to stand by Mr Di Canio and the contents of our statement". They also claimed that Tehoue, who only started once for the Robins and has since been released by Orient at the end of his deal, was in breach of contract after refusing to train during a scheduled session. 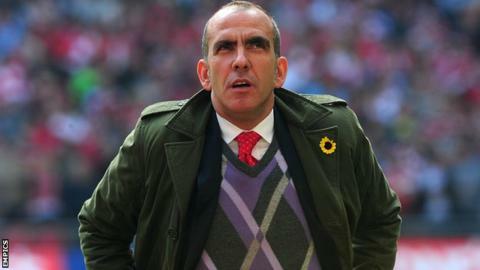 Di Canio flew back to his native Italy after guiding his side to the League Two title this season, but returned to Swindon on Wednesday to announce he had agreed a new contract to stay with the Robins until 2015. Referring to Tehoue's claims, Di Canio added: "It's only a story because someone wrote it down in a newspaper. The club was straight and there is everything in the club statement. "I can only add in an extra line to say that the true story will come out one day and one person will be in trouble but it's not Paolo di Canio, for sure."